It’s been 14 years since Ballykissangel was last produced, and in response to viewers’ requests I’ve been tracking down what some of the actors in the series have been up to since the show ended. I was saddened to find out that actor Peter Caffrey, who played Padraig O’Kelly, died on New Year’s Day of 2008 at the age of 58. The Dublin born actor, who was with the series since its inception in 1996 until 1998, suffered a stroke in 2000 which left the right side of his body paralyzed. Despite his disability, O’Kelly continued to act and in 2005 played a paralyzed pub owner in a film which would go unreleased called Sweet Dancer. 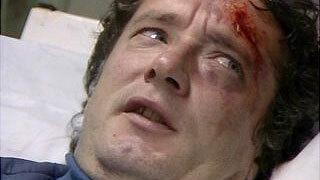 That wasn’t the first time Caffrey had transferred a personal disability into a character he played. It happened in the early 1990s when he underwent radiotherapy for cancer of the mouth. The treatment left him with a speech impediment, which director Danny Boyle had the fortitude to incorporate into the role of a bishop that Caffrey played in the comedy Arise and Go Now. Caffrey recounted his audition experience in a later interview. "The producer knew nothing about my illness and I could see his jaw dropping as I spoke," recalled Caffrey. "He asked me what the hell I was doing there. All the optimism I'd mustered went and I started heading for the door when the director [Danny Boyle] said: 'Why shouldn't the bishop have a speech impediment?' He really went out on a limb for me." Caffrey also played a "man of the cloth" in 1991 when he played Father O’Rourke in Britain’s longest running serial drama, Coronation Street. Being a priest was actually something Caffrey seriously considered after he left school and attended a seminary. He was there for two years, but the experience seemed to have had an adverse effect on him as he became an atheist! Caffrey then studied English at University College in Dublin and on leaving taught elementary school for a year. Appearing in Father Ted, 1996. While living in Dublin, Caffrey shared an apartment with actor Liam Neeson and it was during that time that he first started his own acting career at Dublin Project Theatre. 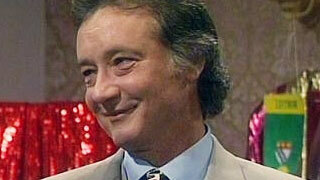 He had his first film role in 1978; On a Paving Stone Mounted, about Irish immigrants living in Britain. Caffrey became one of those same immigrants in 1983 when he moved to London to star in the acclaimed production of Children of a Lesser God. Caffrey divided most of his time between Dublin and London and between stage and screen. Although he appeared in numerous popular British television series though, his biggest success would always remain the role of the dry-witted garage owner in Ballykissangel. 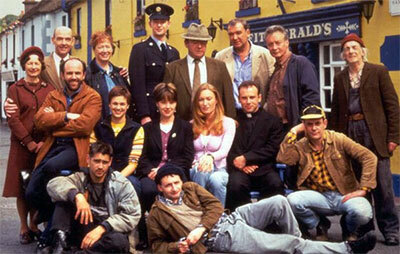 Ballykissangel airs on Afternoon Tea, weekday afternoons at 3:30pm.